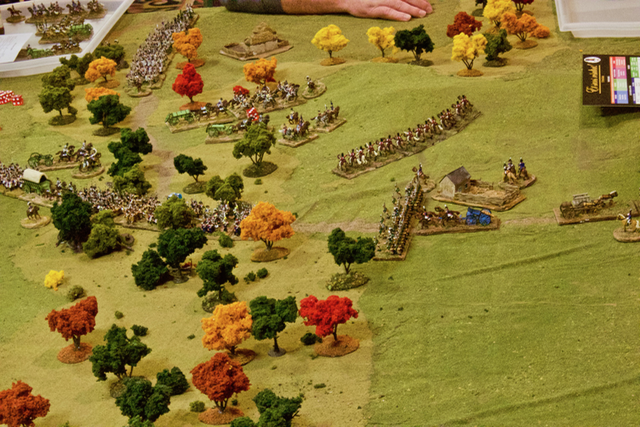 Our second ESR Napoleonics game of Fall-In 2017 featured drastically more aggressive action by the French and they were rewarded for it. All brand new players in this introductory game, and we apologize for the several additional people who were hoping to get into an open slot and contented themselves to observe the game. We were also delighted by the surprise of receiving the game award for our time slot on Saturday! A marshal's baton in the satchel of every game master indeed! You can see how the rest of the action went in our Gallery, please check it out!